Made a brief stop at Great Ashfield airfield today on my back from visiting family up north. 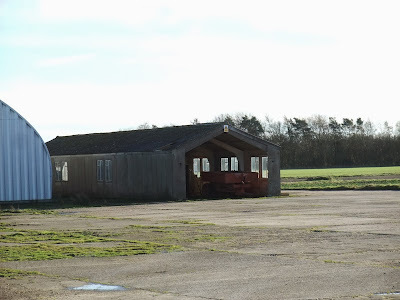 This aerodrome opened in March 1943, although the site it was constructed on was used by the RFC during the Great War for flying BE2cs. It was briefly used by Bomber Command for practice landings for Stirlings before being handed over to the USAAF. In June 1943 it became home for 385th Bomber Group, nicknamed "Van's Valiants" after its CO, Col. Elliot Van Devanter. 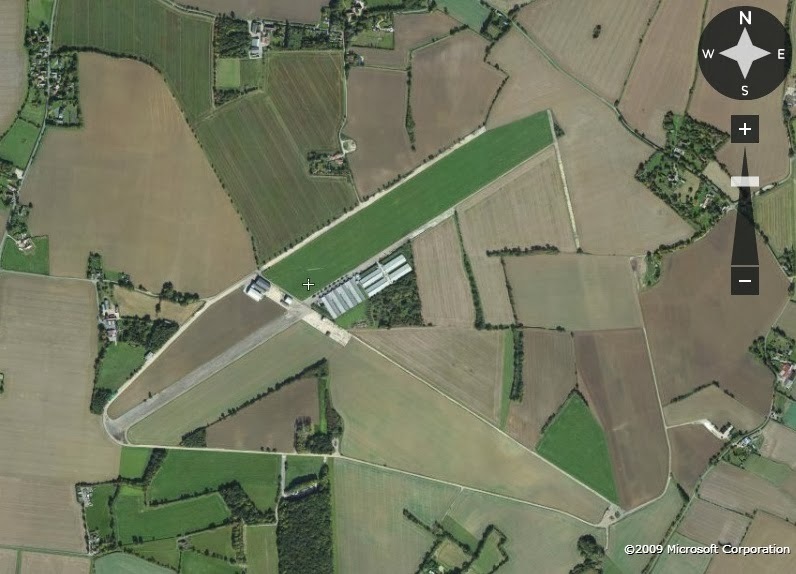 Above: Aerial of Great Ashfield airfield as seen today. The 385th Bomber Group flew B17's, flying 296 missions (8,200 sorties)and losing a total of 129 bombers to enemy fire plus another 40 to accidents. One of the destroyed bombers was lost to a Ju88 night intruder; destroyed in its hanger during the night 22nd May 1944, the only B17 destroyed on the ground during the War. 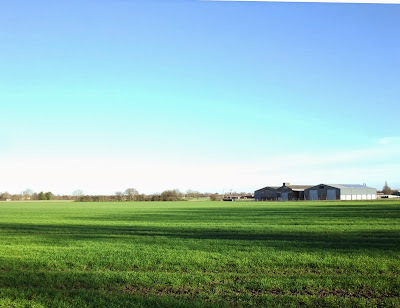 The airfield / surrounding area was attacked at least two other times during the War - once on 6th October 1943 when six HEs landed on Great Ashfield, probably all dropped by FW190's, and another intruder attack, machine gunning the airfield almost at the end of the War. The gunners of 385th Group claimed 280 Luftwaffe fighters. Little remains today except for part of the runway, a few buildings from the domestic sites, and the Battle HQ. 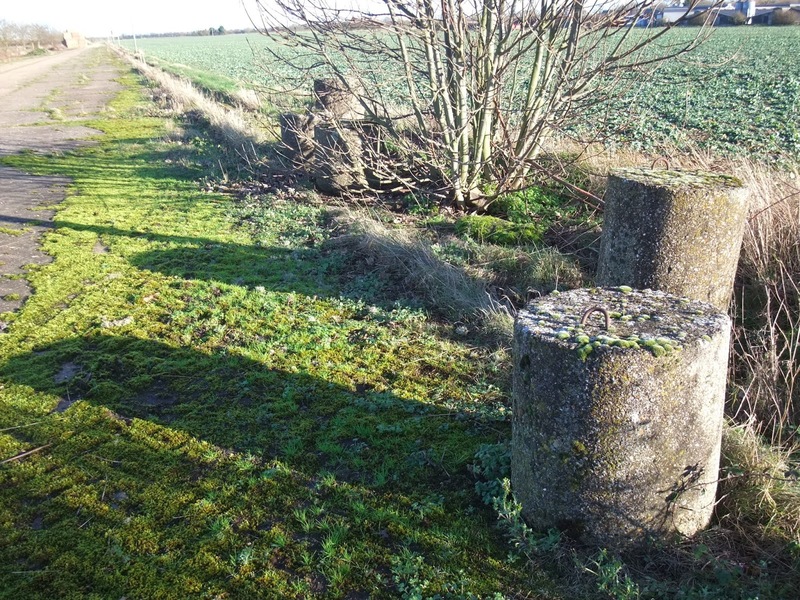 Some concrete cylinder road blocks can also be seen - many of these blocks can also be found on the nearby 11 Corps Line which runs through the area. Top - entrance to the airfield on the western perimeter. Note the road block cylinder in the foreground. 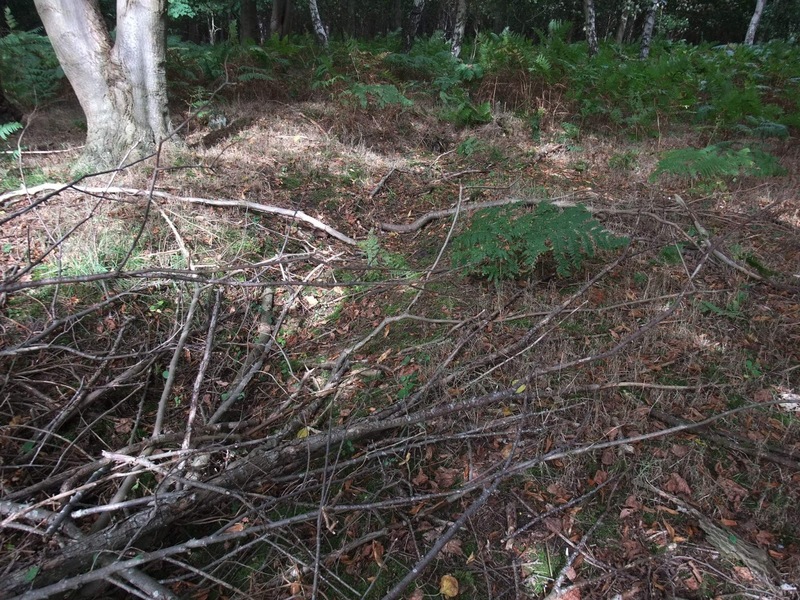 In the copse can be found what look like trench remains, perhaps part of the airfield defenses or a PAD trench. Bottom: View of the western perimeter of the airfield. 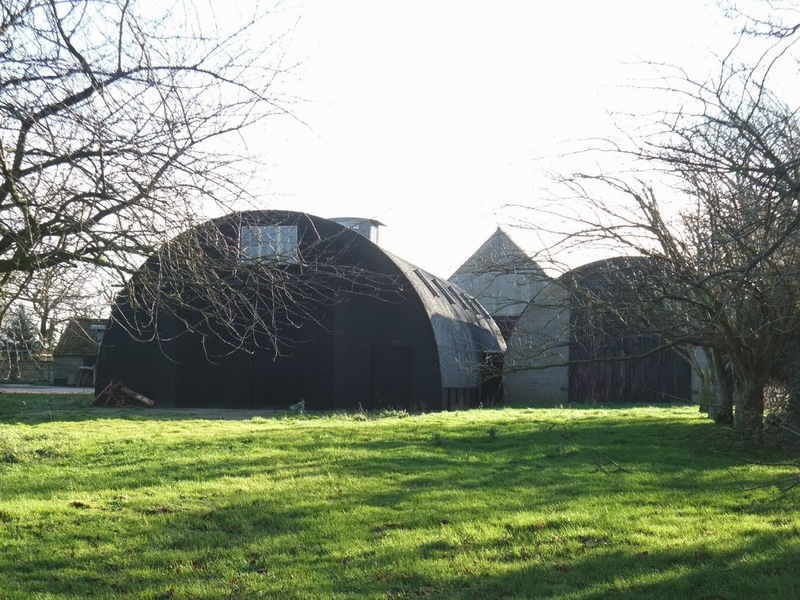 The two large buildings may be remaining hangers, although subsequently much improved after the war. The Battle HQ (which would have been used to direct the ground defence of the airfield) - now overgrown with bramble and the lower command chamber flooded. Top - more road block cylinders on the north-west perimeter track of the airfield. 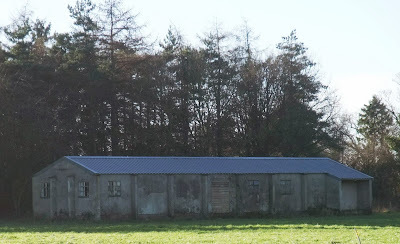 Middle and bottom - perhaps surviving buildings associated with the airfield, although much altered. 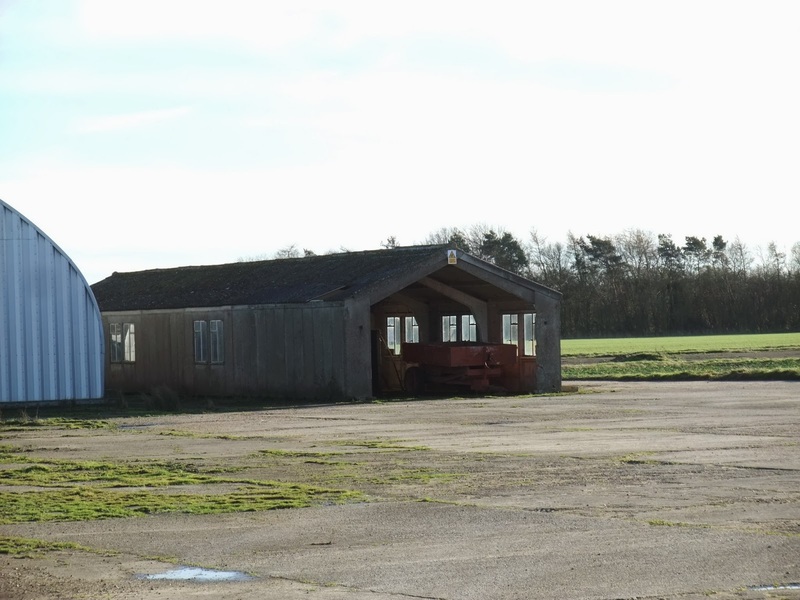 Buildings remaining on domestic sites on the north-west of the airfield. The top image is thought to be Barrack block. Although the GHQ Line did not run through Suffolk, the War Diary of one artillery Regt, that later moved to the Suffolk coast for beach defence, notes some of it’s experiences on manning the GHQ Line which makes interesting reading. 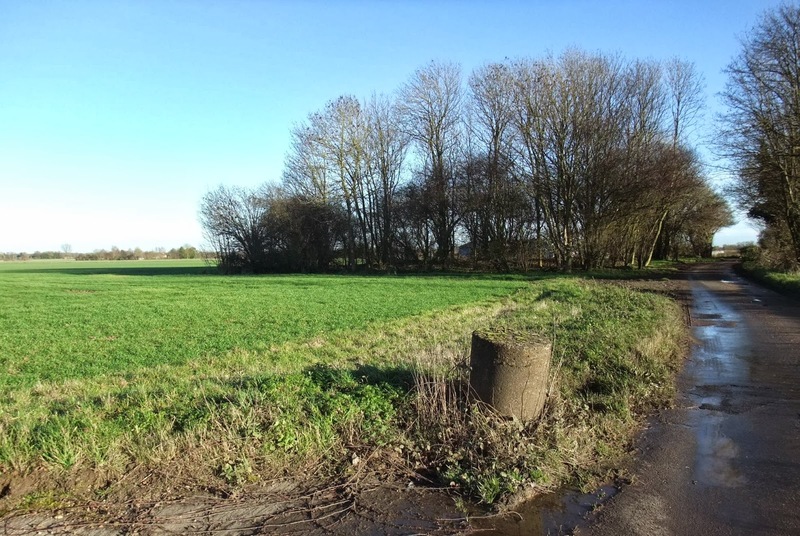 The Regt was posted to a section of the line in Cambridgeshire during July 1940, when 2 Corps issued orders to man the whole of the GHQ line (excluding pillboxes at Stapleford and Fen Ditton). 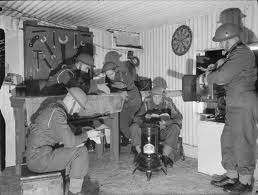 Despite the fact that only a third of the Regt had arms, orders were given to man all pillboxes to in it’s sector prevent them falling into enemy hands!! The Regt had to organize moving into new billets along the line and cookhouses had to be established. During July 17th – 18th, thirteen 6 pdr anti-tank guns arrived for mounting in the pillboxes. 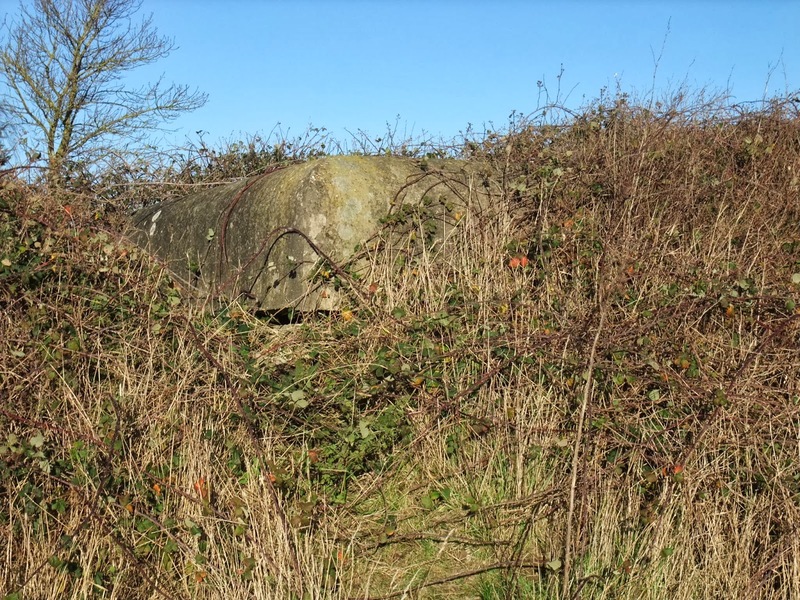 However it was found that the pillbox embrasures had been made too small for the gun shield to be placed in position and had to be enlarged; 50 rounds per gun were issued. The Regt was still responsible for manning all the Bren and 2 pdr pillboxes, despite only having 6 pdrs! As an indication of how short supplies were of everything at this stage of the War, basic equipment such as webbing, boots, anklets and clothing etc was still being issued. Life must have been basic for the troops at this time as the War Diary notes that the arrival of transport (two lorries, two small vans and three cars) made simple things such as carrying out laundry, taking troops for baths etc much easier. Firing practice took place at one of the pillboxes, using a large sandbagged target at 200 yards. The War Diary notes no misses and that the gun was easy to handle. Camouflage works were also carried out on the pillboxes. Great care was also taken over the smartness and cleanliness of pillboxes, with a completion for the best kept pillbox! A well known image from a pillbox on the GHQ Line in Essex with a 6 pdr gun installed. 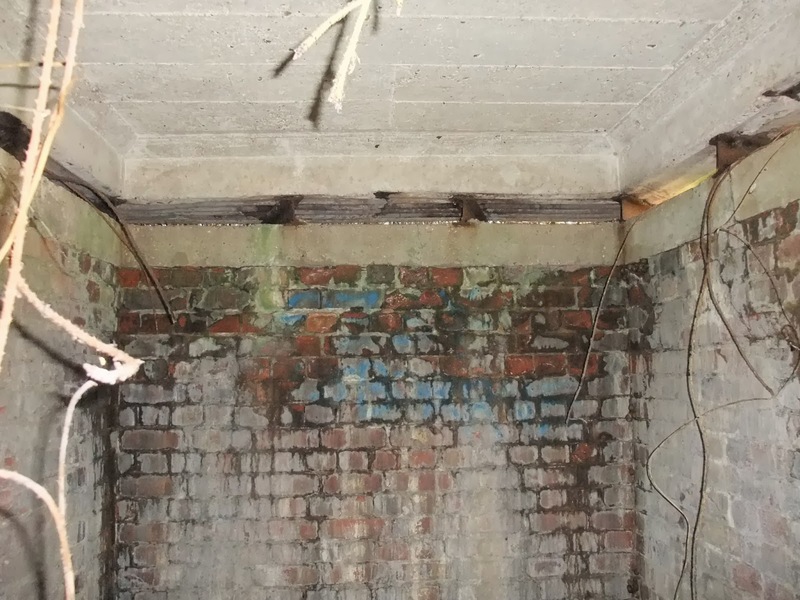 It shows how troops tried to make the best of manning pillboxes. Communication between the pillboxes and Battery HQ was set up with a pigeon service, the pigeons supplied by a local farmer and food from 2nd Corps. Above: Pigeon services were widely set up to carry messages between troops and HQ's. Will hopefully get around soon to posting more details about this on the main Suffolk Anti-invasion Defenses website. Towards the end of August the part of the Regt received orders to move to the Suffolk coast for an operational role in beach defence. The rest of the Regt remained on pillbox duty. A War Diary entry for August notes that by now the men were armed with rifles, a few Lewis guns and Boys anti-tank rifles. 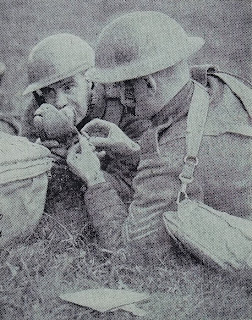 By Sept, each detachment was cooking for itself and the pillboxes were more self contained then ever. Each pillbox had five days of preserved ration per man. When the code word Cromwell was issued this section of GHQ Line was fully manned. Great attention was paid to the tactical aspects of pillbox defence during this period. Preparations had to be made to receive a draft of 100 men from a Defence Battery who were to take over the pillboxes. By October,thoughts were turning to making the pillboxes more hospitable for winter. Small cookers and stoves were installed. On Nov 10th the Regt was fully withdrawn from the pillboxes. All guns were taken from their mounts and put into mineral jelly. The Regt was concentrated in Cambridge but had to keep the pillboxes for a while longer as the Defence Battery was assigned a coastal defence role instead. 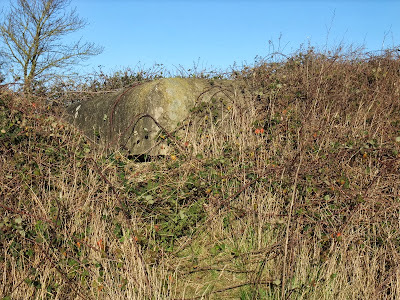 In December the Regt was finally relived of the pillboxes. So a short snapshot of life for the troops at the height of the invasion scare; similar situations must have been repeated along all stretches of the GHQ line completed, and at all beaches where a landing was considered possible. At RAF Station Hethel, a remarkable defence post still exists. 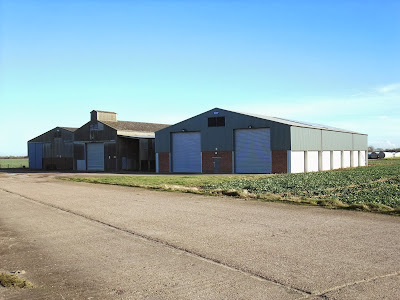 Admittedly, RAF Hethel is in Norfolk and not Suffolk, but the records for this site do provide some interest in relation to the defence of airfields in Eastern Command. Work on Hethel began in 1941 and the station was opened late 1942 and was actually one of the RAF Stations handed over to the USAAF for the use of its bomber units. The defence post was constructed in accordance with a new policy adopted by Eastern Command. 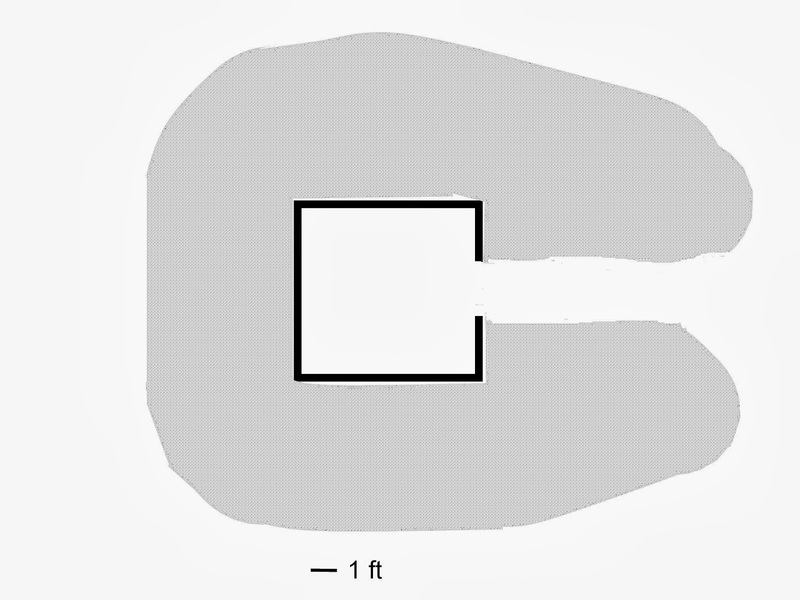 Previously, airfield defences had been built as a result of the Taylor Report and largely consisted of pillboxes and breastworks which were large and conspicuous and vulnerable to air attack. Experience at Crete had shown the need for small inconspicuous field works. 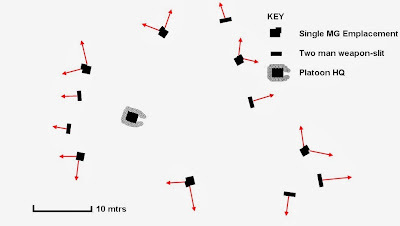 The new defences were to now consist of small two man weapon-slits and small machine gun pits constructed in accordance with “Infantry Training, 1937” Supplement No.3 – “The design and lay-out of Field Defences, 1942”. 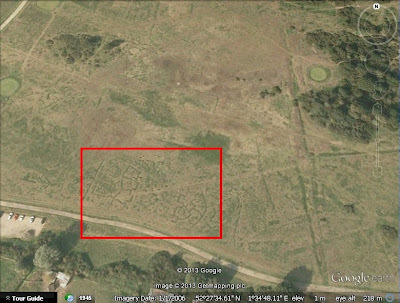 Above: The defence post at RAF Hethel produced using a hand held GPS. It shows the weapon-slits and arcs of fire. The defence scheme at Hethel was planned entirely in accordance with this new policy and the defences at two other aerodromes, West Rayham and Great Massingham, were altered in view of the change in policy for the defence of aerodromes. The defence post at Hethel appears to consist of a layout of weapon-slits and machine gun pits surrounding a platoon headquarters. 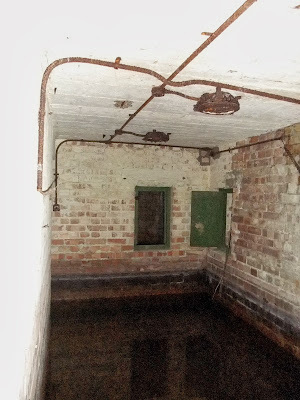 The weapon-slits and machine gun pits are lined with 9” brickwork and would have been tanked in 3” asphalt. 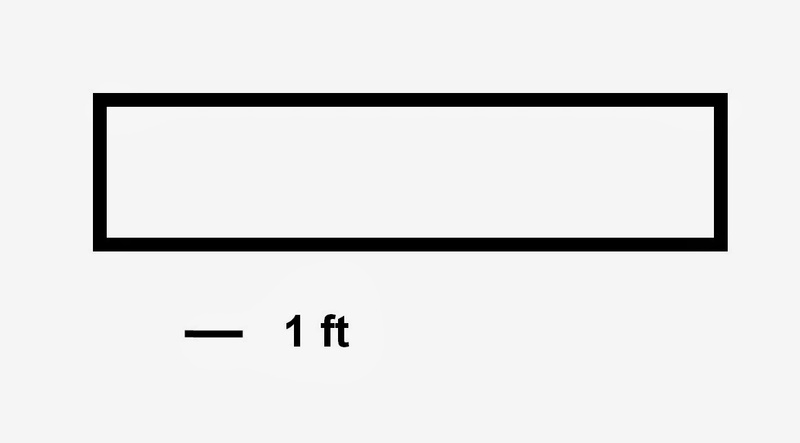 The weapon-slits are 12 ft long by 2 ft wide, so maybe three man weapon-slits. In total there are six weapon-slits, supporting the machine gun pits. 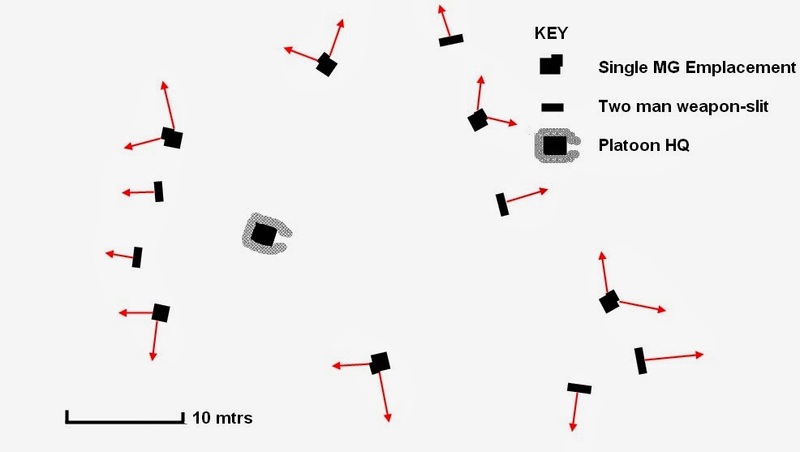 There are two types of the machine gun pit, although the variation is slight. 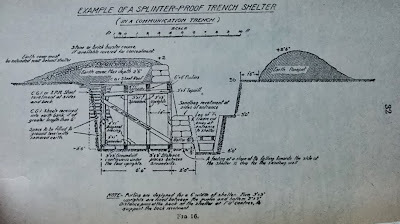 The pits were supposed to have been constructed according to “Infantry Training 1937” Supplement No.3, page 9, fig, 7, although they are the basically the standard MG emplacement in open ground as shown in “Manual of Field Engineering” , Vol I 1933. In total there are six machine gun pits. 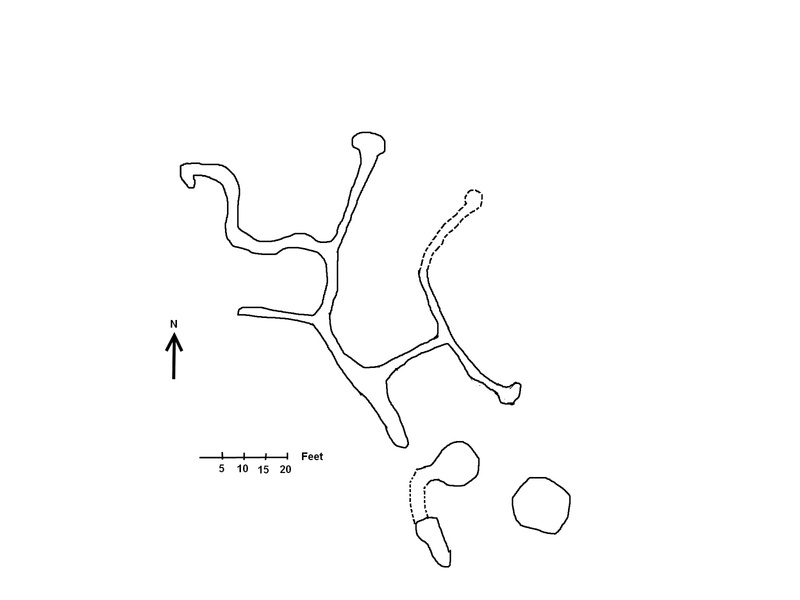 Above: Top image shows MG emplacements in open ground, "Manual of Field Engineering", Vol. I 1933. The above emplacements are clearly based on fig.3. Bottom image shows the machine gun pit illustrated in "Infantry Training, 1937", Supplement No.3, page 9, fig. 7. The weapon-slits surround a “cut and cover” type dugout, perhaps a platoon headquarters. The dugout is lined in 9” brickwork and has a 7” thick concrete roof, capped with earth. According to specifications, the platoon headquarters was to be constructed according to Field Service Pocket Book 1938, pamphlet No.4, page 32 but lined with 9” brickwork and tanked in 3” asphalt. 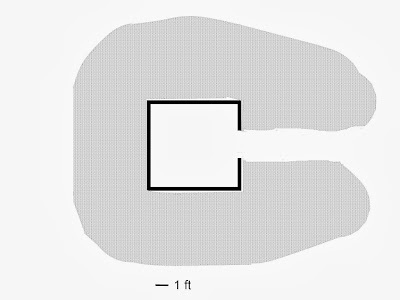 Above: The "Cut and Cover" dugout and plan. 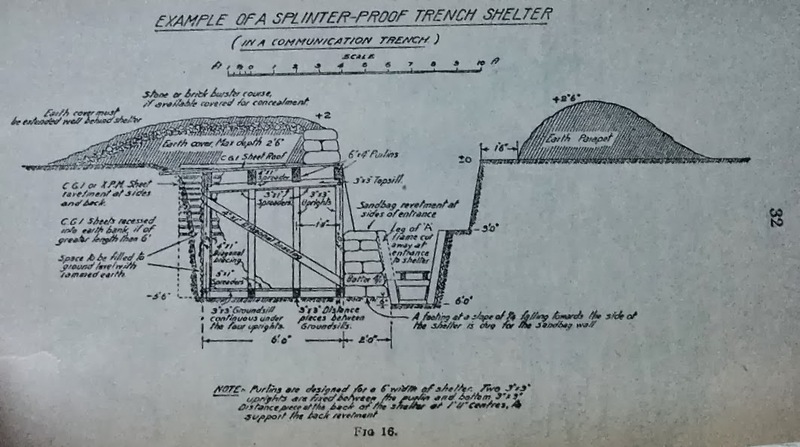 Bottom image shows the splinter proof shelter in Field Service Pocket Book 1938, pamphlet No.4, page 32. 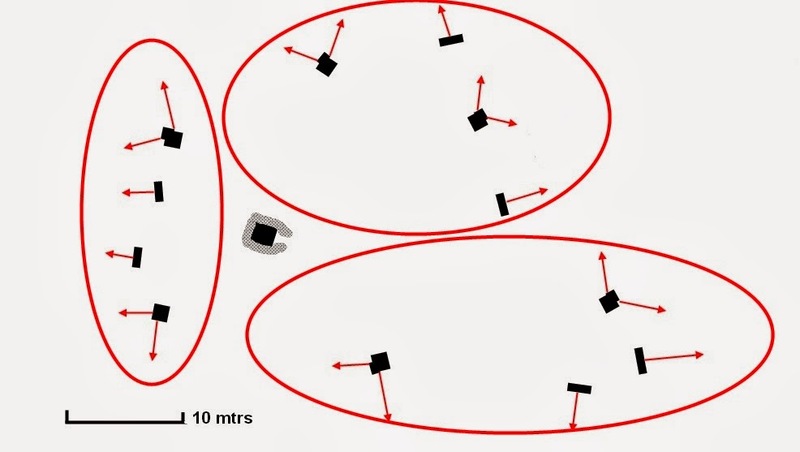 The whole layout may be a strongpoint consisting of three medium machine gun sections. This would be in accordance with the overall defence scheme to be adopted for aerodromes of self-contained platoon localities (although only two sections normally made up a medium machine gun platoon) distributed at or near the aerodrome perimeter. Platoon posts were to be designed for all round defence and be mutually supporting if possible. 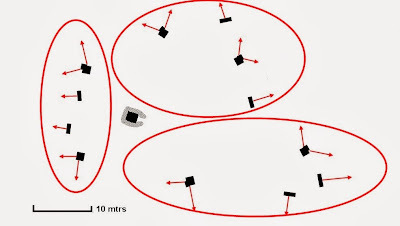 Within the platoon post, section posts were to be close enough to facilitate control but not to be in such so close proximity that one bomb could destroy more than one post. Above: Does this defence post consist of three medium machine gun sections? Bottom image shows a layout for a medium machine gun section as illustrated in "Infantry Training, 1937", Supplement No. 3, "The design and lay-out of Field Defences, 1942"
The cost to construct these works was estimated to be £2,490. I’m not quite sure how the 12’x2’ weapon-slits in this post fit in with the above specification. The second post with a trench theme, this time Second War. This trench can actually be tied into a position to be held by the 2/4 South Lancs Regt in 1940 in the Mount Pleasant area, Dunwich. I've known about it for a while but only just got round to mapping it. 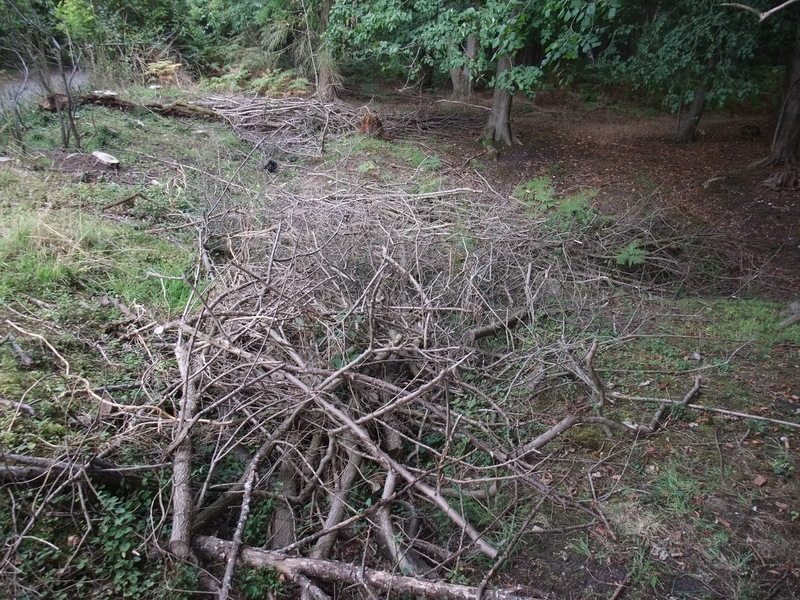 Wish I had done it sooner as it has now been filled with brash from the clearance of road side scrub, which made recording by tape and offsets very tricky! 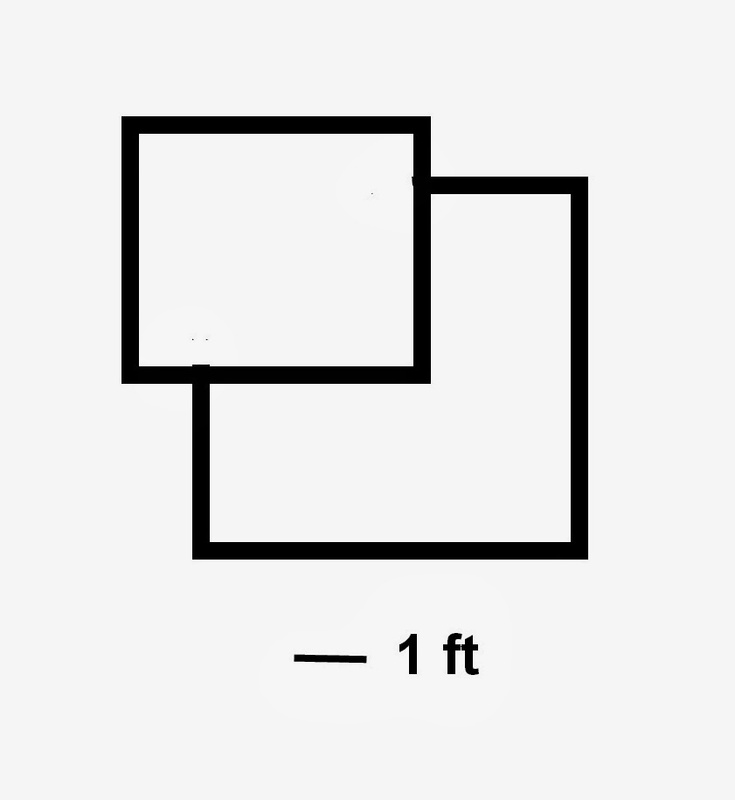 Hence the plan shown is not as accurate as it could have been, but I believe it is still an accurate representation. Above: Top the section post at Mount Pleasant from the 2/4 S Lancs War Diary. 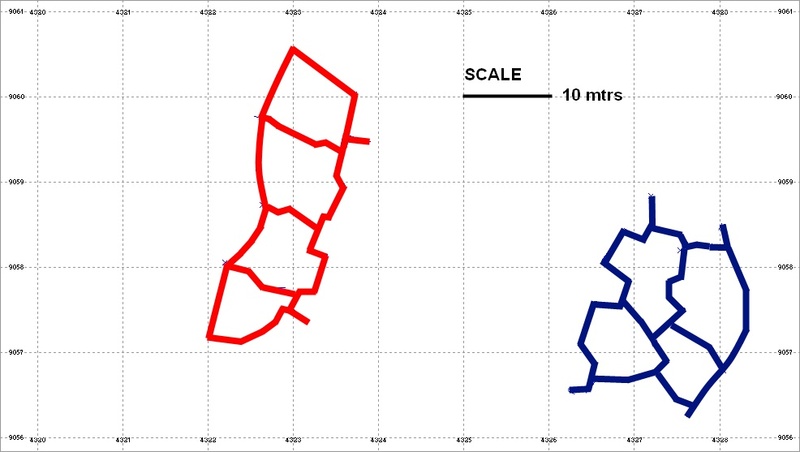 the green lines indicate rifle fire and the red line Bren gun fire. Middle and bottom - the trench today, full of brash! The trench system consists of communication trenches leading to various weapon-pits and also perhaps a section of fire trench. 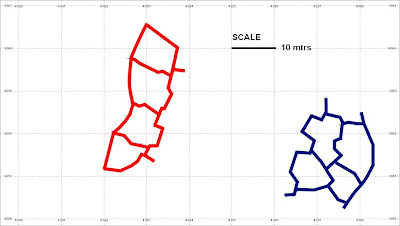 There are also two large pits in the vicinity, one perhaps connected to part of the trench system. 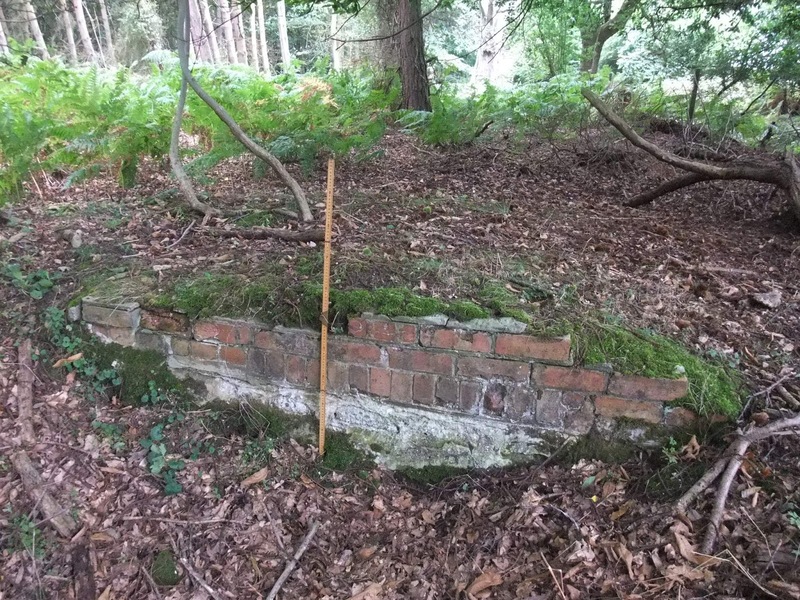 Also nearby is the remains of a brick structure, of which I have no idea of its purpose, but guess it is military. Above: Remains of brick structure. Bottom image shows a meter ruler for scale. With a few days off work, I've been out and about in the field. 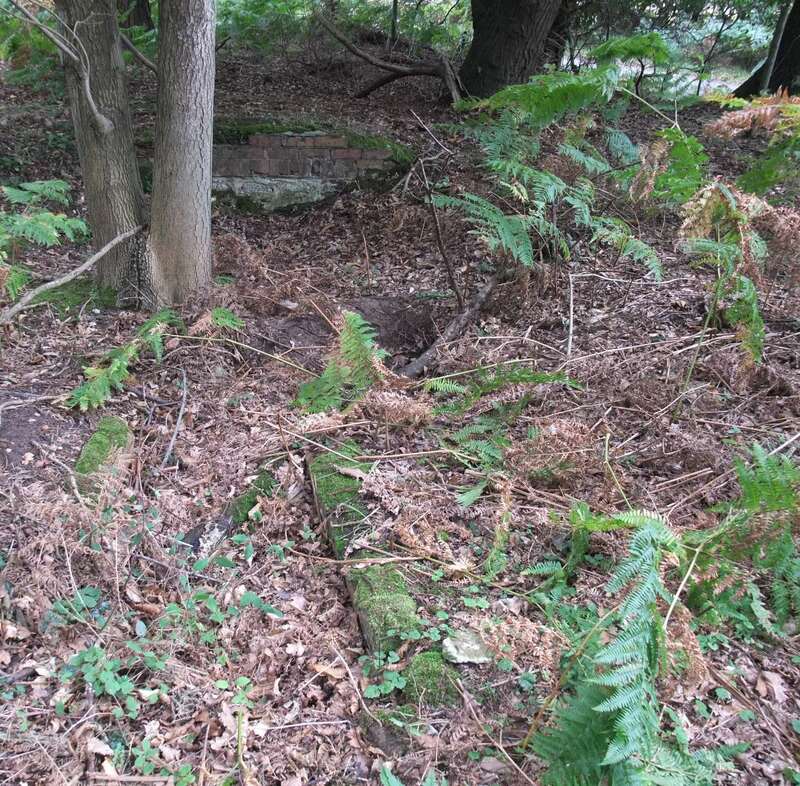 This is the first of two posts that will look at trenches - one from the First War and one from the Second! This afternoon, I decided to combine a visit to an excellent second hand bookshop in Beccles (cost me £24!) with a visit to look at the First War practice trenches on the Common. These WW1 practice / training trenches are fairly well known. Although they have long been infilled they show up as marks in the grass extremely well from the air and also on the ground as well. I don't have any information of which unit dug them or when. Although how Suffolk was to be defended in the First War is something I want to start looking at, I doubt if I will ever find out which units were billeted in Beccles or when these trenches were dug; they would obviously have nothing to do with Suffolk's fixed defences in WW1 but would have been dug by troops as practice before being sent out to France. Above: Top - aerial photo of the trenches, which still show up clearly. The above images show just how clearly the trenches still stand out; obviously from the air but also good enough on the ground to allow me to follow them with my GPS. The crenelation of the fire trenches show up clearly, as well as saps leading out from the front line. Communication trenches lead back to a support line. Where these trenches dug to represent opposing lines?? The following images will show just how well they show out on the ground, which amazes me as photos I take of surviving WW2 trenches never seem to come out! Above: A series of images of the trenches - they clearly stand out as the 'greener' vegetation. 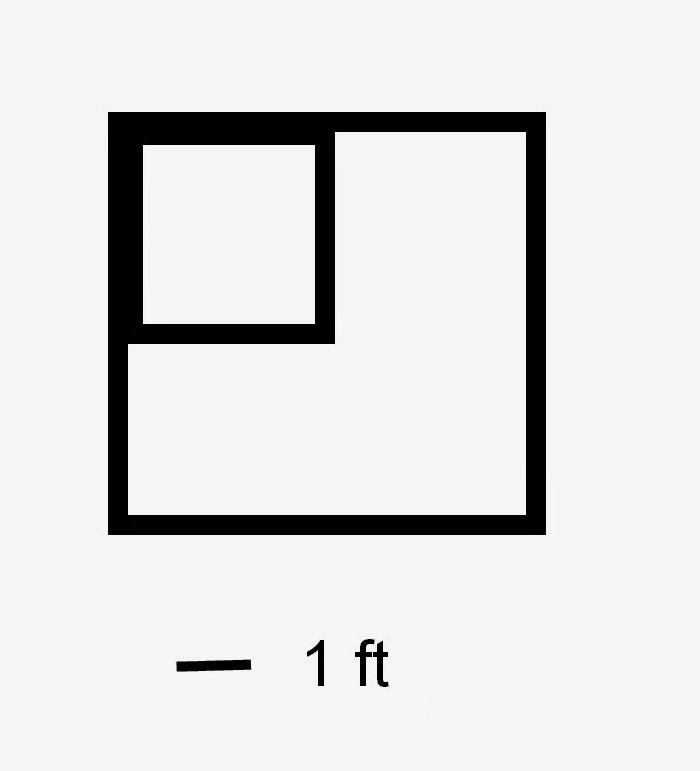 The last image shows a meter ruler for scale. An intriguing find was a small shirt button. It is certainly of the type used by the Army in the First War as similar buttons are one of the most common field finds my brother and I come across while walking the fields of the Somme. Stamped on the back, as far as I can make out, is: "BIRM HGILL"; after the BIRM is a smaller M stamped above but the text formatting of Blogger won't allow me to show that! I'm sure that these buttons were also common place outside the Army, but it would be nice to imagine it came from the shirt of a soldier digging these trenches! Plenty of rabbit action in the area so it's not implausible that it could have been bought to the surface after all these years! Above: Small shirt button found while recording these trenches. Top photo shows my GPS for scale. Finally while here, I could not resit visiting the Type 22 pillbox on the Common. It is one of the variants with additional lower embrasures, considered to be for the Boy's Anti-tank rifle. All in all a very enjoyable afternoon. I think I also provided the local dog walkers with amusement, wondering around at a snails pace with a GPS and taking random photos of a meter ruler etc!! It's been a while since I last did a post and I have a few things to write up from various trips out and about this year. The first is a visit made back in the spring to a section of remaining seawall constructed on the Orford Battle Training area for 79th Armoured Division. This particular seawall features in a well know photograph of a Churchill tank scaling the wall using an ARC Mk 1. 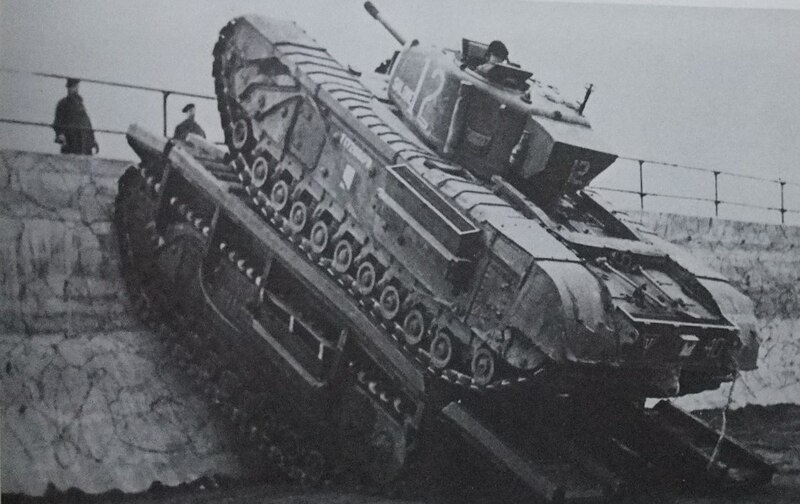 Above: Well known image of a Churchill tank scaling a mock seawall on the Orford Battle Training area. Today the remaining section of seawall is largely overgrown but it is clearly identifiable as the one in the above image, with even some of the embedded wire pickets to support the barbed wire in the above photo still remaining along with remains of 2" scaffolding poles which made up the railings. Above: Remains of the Orford seawall today. 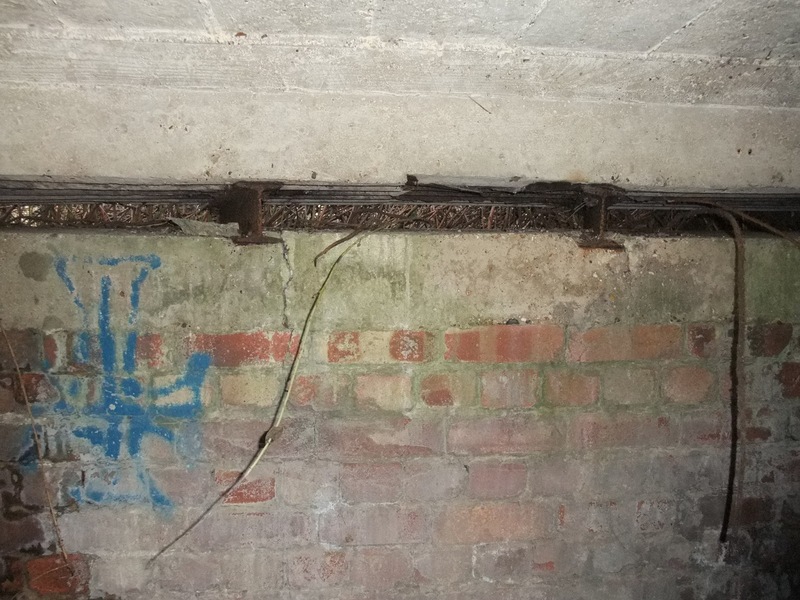 Note the barbed wire picket in image no 4 and the remains of the railing in image no 5.